Alan Steinfeld Hosts with Joe Dispenza, J.J. and Desiree Hurtak and Marilyn Schlitz. Enhance the Perception of your Mind and Awaken the Nature of Your Heart. Incantations and Affirmations to Dissolve, Protect and Transform. Recordings, Interviews, Videos and Historical Documents. 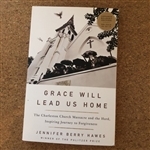 Jennifer Berry Hawes' new book Grace Will Lead Us Home. Mother Emanuel AME church in Charleston, South Carolina. study. He arrived with a pistol, 88 bullets, and hopes of starting a race war. President Obama. And a city in the Deep South must confront its racist past. His readings are a unique and uplifting experience. He is a well-known and much-liked reader in the UK. Of the many critical conversations we will all have throughout our lifetime, few are as important as the ones discussing death--and not just the practical considerations, such as DNRs and wills, but what we fear, what we hope, and how we want to be remembered. Yet few of these conversations are actually happening. Inspired by his experience with his own father and countless stories from others who regret not having these conversations, Michael Hebb cofounded Death Over Dinner--an organization that encourages people to pull up a chair, break bread, and really talk about the one thing we all have in common. Death Over Dinner has been one of the most effective end-of-life awareness campaigns to date; in just three years, it has provided the framework and inspiration for more than a hundred thousand dinners focused on having these end-of-life conversations. As Arianna Huffington said, "We are such a fast-food culture, I love the idea of making the dinner last for hours. These are the conversations that will help us to evolve." Let's Talk About Death (over Dinner) offers keen practical advice on how to have these same conversations--not just at the dinner table, but anywhere. There's no one right way to talk about death, but Hebb shares time- and dinner- tested prompts to use as conversation starters, ranging from the spiritual to the practical, from analytical to downright funny and surprising. By transforming the most difficult conversations into an opportunity, they become celebratory and meaningful--ways that not only can change the way we die, but the way we live. Awakening Your Power of Self-Healing helps you to develop a deep awareness of your body and to engage in appropriate, pleasant exercise at the same time. We want to help people understand that there is a way to exercise their bodies safely. We want to help you become aware of your body’s needs, and respond to them. It is time to give up the idea of “no pain, no gain” - instead, Dr. Meir Schneider and his School for Self-Healing would like you to understand that you have everything to gain, with virtually no pain. The book is written very specifically to be easy to follow. We include 600 exercises, many of which are unavailable anywhere else in the world, along with 300 hand-drawn illustrations meant to clarify the movements for our readers. Above all, we worked hard to make this book friendly, practical, applicable, and useful. We wrote this book chronologically, according to the body’s needs. We begin with a chapter on breathing, to teach you to breathe slowly, deeply, and smoothly - this is the foundation on which good health is built - and progress from important, universal knowledge to information for specific diseases. Virtuoso pianist Arthur Rubenstein developed crippling arthritis throughout his whole body, except for in his hands. Their consistently fluid, effortless, and balanced movement during years of performance kept his hands in wonderful shape, even as the rest of his body failed him. Our book, Awakening Your Power of Self Healing, is designed to teach you to bring the power of healthy movement into every part of your life, and overcome disabilities and diseases on which others will tell you to give up. It contains revolutionary knowledge you need to grow healthier by the day, prevent disease in the future, and greatly improve your current conditions. Meir Schneider, PhD, LMT healed himself of congenital blindness and developed an original holistic approach to health. The Meir Schneider Self-Healing Method is a unique combination of therapeutic massage, movement, and natural vision improvement exercises for prevention and rehabilitation of degenerative conditions. A globally respected therapist and educator, Meir is also a bestselling author. His latest book, Vision for Life, was published by North Atlantic Books. He is the founder of the School For Self-Healing in San Francisco. meditation mp3 which guides you to explore other lifetimes you have lived. entering the mind, the sense of "knowing" and physiological changes. Rabin - Tuesday, Oct. 30, 7-9pm, Church of the Ascension, 12 West 11th St.
pain control, plus a 7 Day Reboot Cookbook, all authored by Dr. Pedram Shojai.